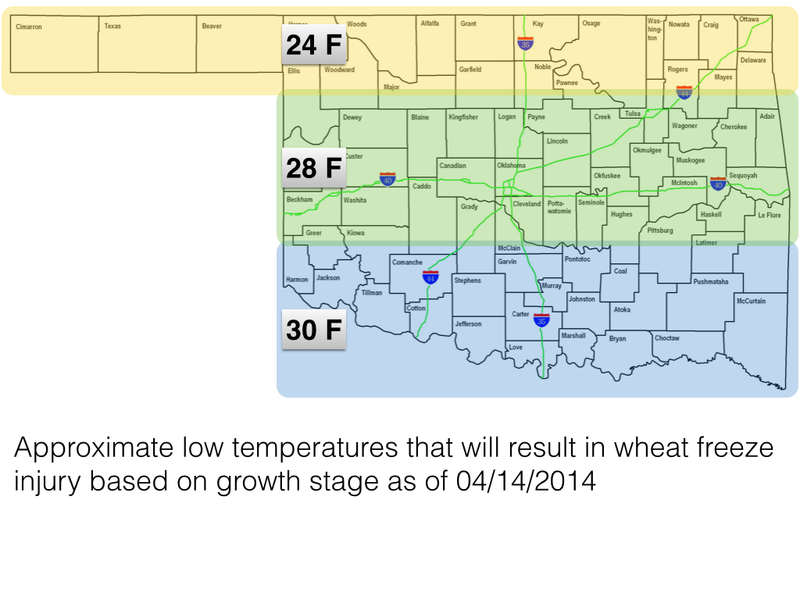 Temperatures over the weekend were cold enough to cause injury to the Oklahoma wheat crop. As shown in the figure below from the Oklahoma Mesonet many areas of Oklahoma spent several hours below 28F. 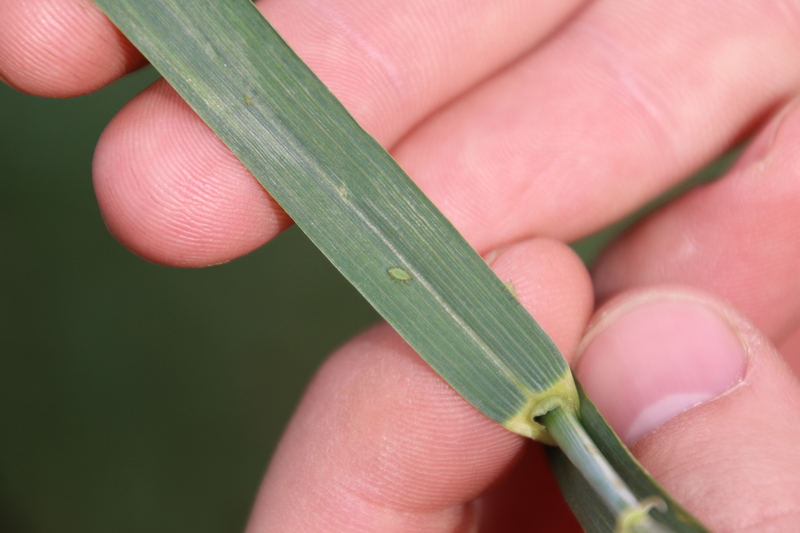 While temperatures in the wheat canopy might have remained slightly higher than reported air temperatures, they were still probably low enough to result in significant injury to wheat. 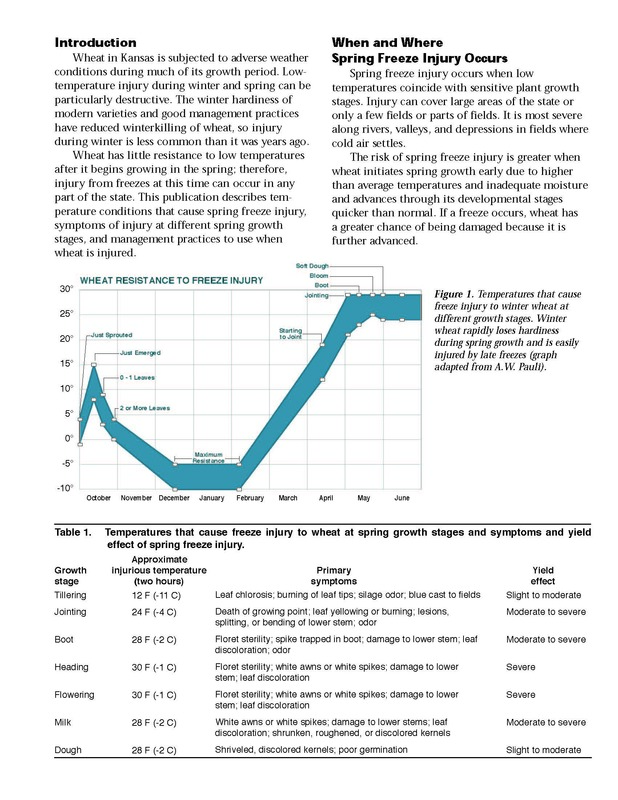 Every freeze event is unique – the temperatures and time durations we use regarding freeze injury are rules of thumb and are not exact. I have seen instances where conventional wisdom would indicate complete crop loss and we skate through with minimal damage. It will take a few days to see how bad things are – Symptoms may start to appear later this week and will likely be clearly identifiable by the end of this week. Healthy wheat heads will remain turgid with a green color. Damaged wheat heads will be bleached, yellow, or brown and will easily break when pushed against. I anticipate that we will not have any partial “blanking” of wheat heads and that most wheat heads will either be okay or a complete loss. 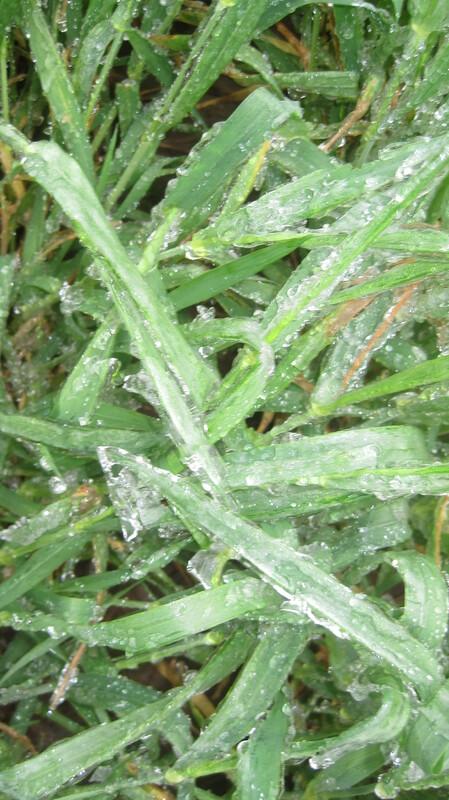 This post from last year has some pictures showing tell tale signs of freeze injury. The linked post also serves as a reminder that while freeze is the concern of the day, the potential worsening of drought conditions in NW Oklahoma has the potential to do far more damage. 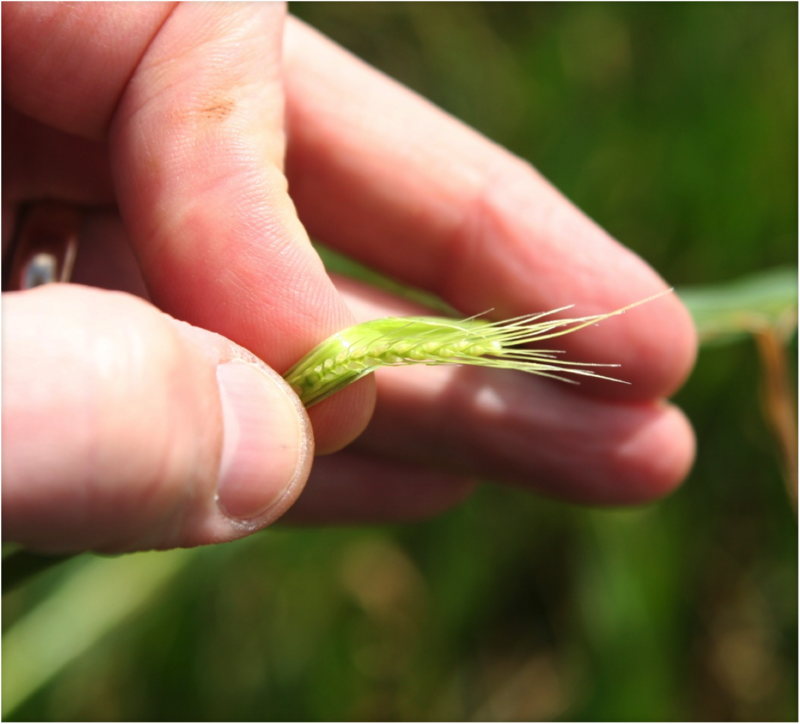 % damaged heads might not = % yield loss – It is still relatively early in the growing season and there is still opportunity for smaller (two nodes or less) wheat to produce additional tillers and/or retain secondary tillers. 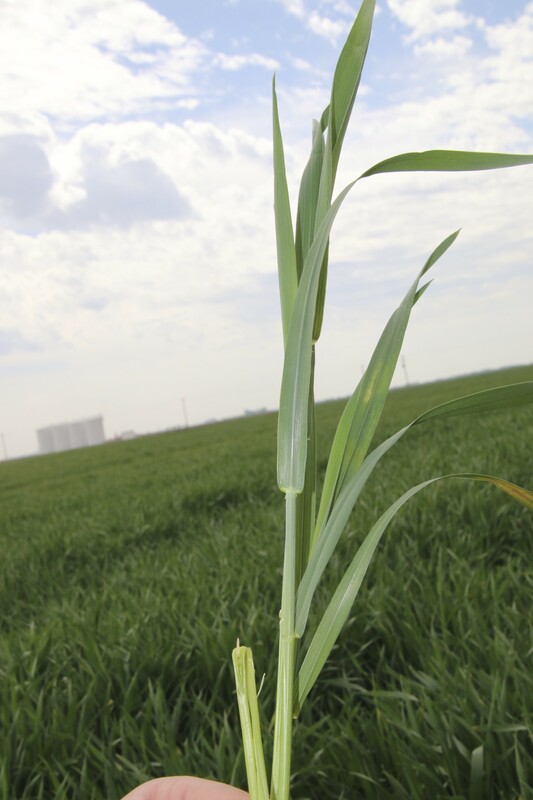 Whether or not these tillers are able to compensate for larger tillers that were lost due to freeze will depend on moisture and weather. IF (and that is a big if) weather conditions remain favorable, late emerging tillers in central and northern Oklahoma might still have a shot at producing grain. It will be tougher for more advanced wheat in southern Oklahoma to make this type of recovery. I have been out in much of the state with wheat field days this week and wanted to share a few observations. Drought conditions are worsening in most wheat producing areas of the state and yield potential is declining fairly rapidly. An area roughly extending from Chickasha to Enid along highway 81 still has some potential, provided that that we receive rain soon. The same can be said for a few small pockets of wheat that received rain earlier this spring in Alfalfa, Grant, and Kay counties. With temperatures predicted to climb to the upper 90’s next week, however, the potential in these areas could decline rapidly. Most other areas of western Oklahoma have very limited or no yield potential remaining. 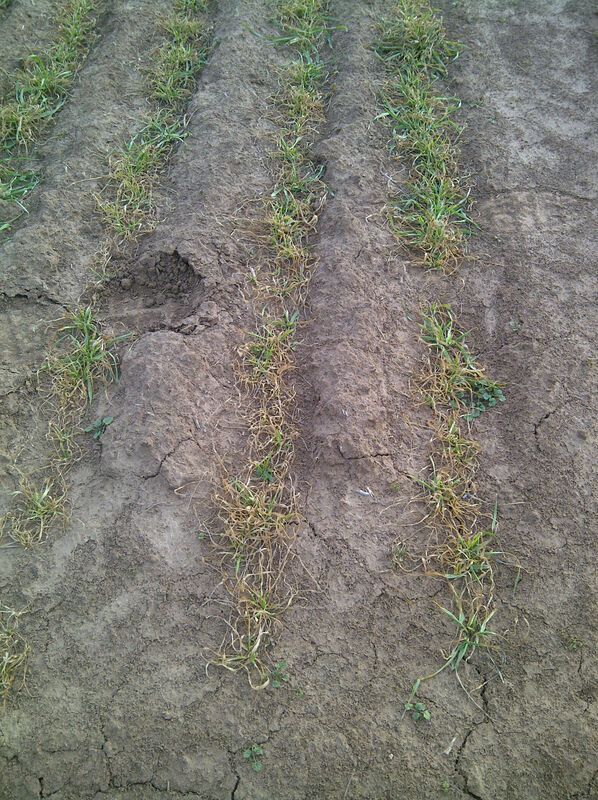 The effects of the April 15th freeze are still showing up in the Oklahoma wheat crop. We have several fields with lots of tillers but few heads. Most wheat south of Hwy 51 in Oklahoma is as fully headed as it is going to get. That is, the heads that were not killed by the freeze are fully emerged. 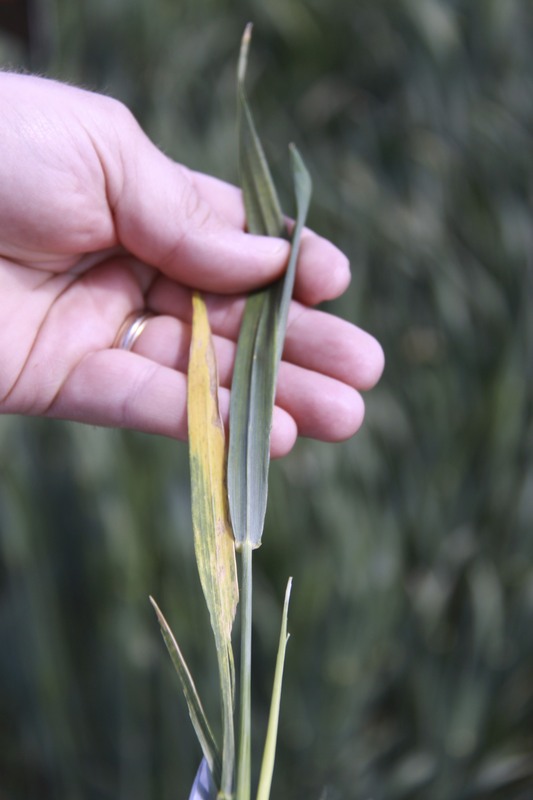 Tillers that still look yellow or even green but are not headed out most likely have dead wheat heads inside. 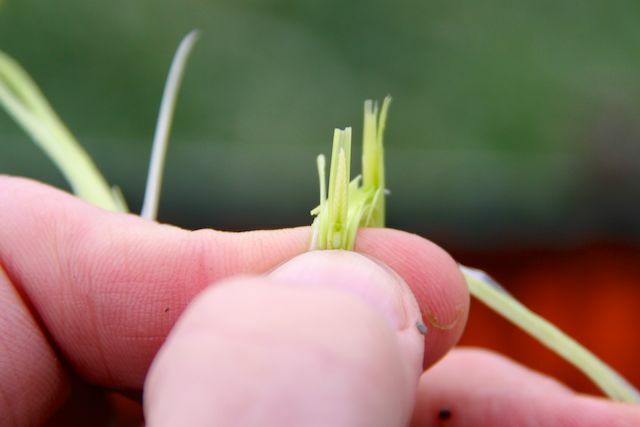 These can easily be identified by splitting the stem and examining the wheat head as shown in the pictures below. 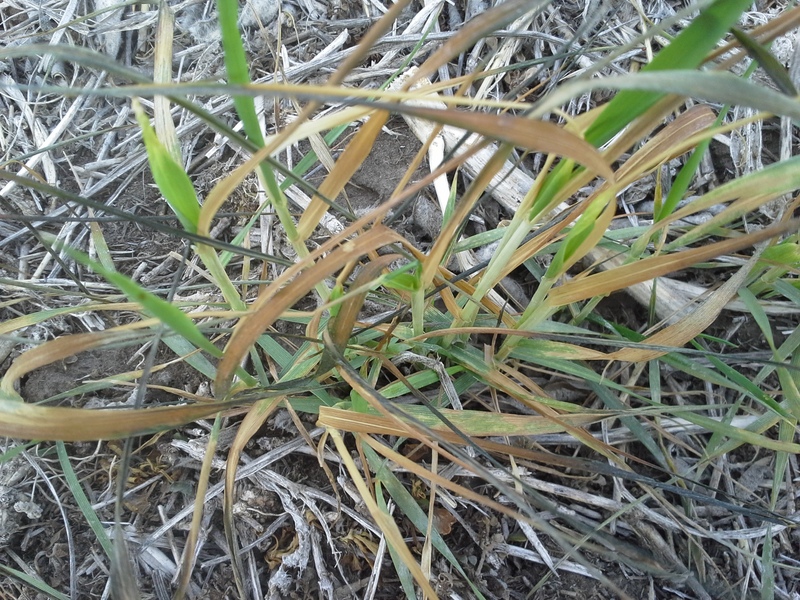 Freeze injured wheat can still have green flag leaves but dead wheat heads. This tiller will eventually turn brown. Freeze injured wheat heads will be brown. 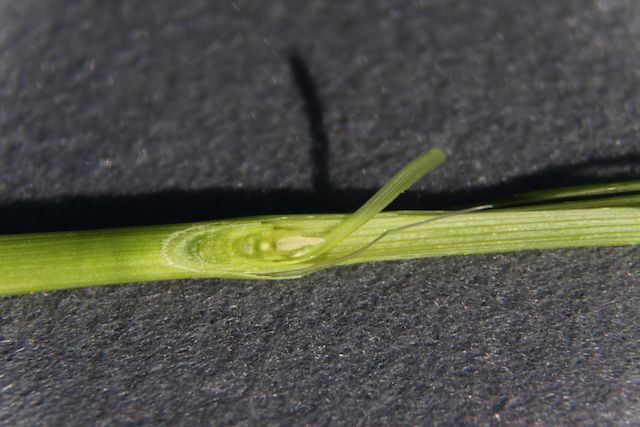 As indicated in the post above, wheat tillers that are not headed out south of Hwy 51 in Oklahoma likely has this type of freeze injury. 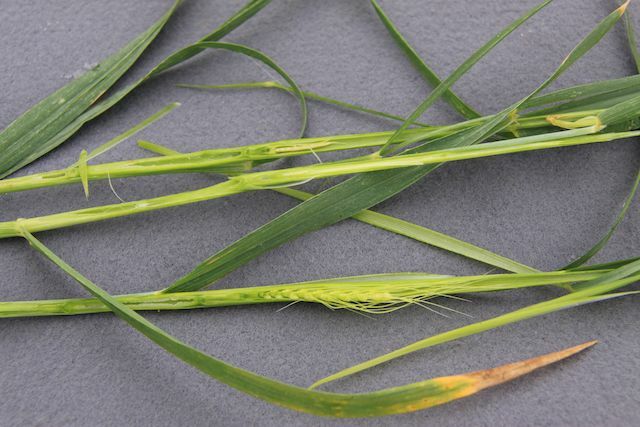 Injury symptoms from the April 14th freeze are now showing in the Oklahoma wheat crop. Robert Calhoun and Matt Knori madeTh a trip through north central Oklahoma yesterday splitting stems (some pictures are posted below). 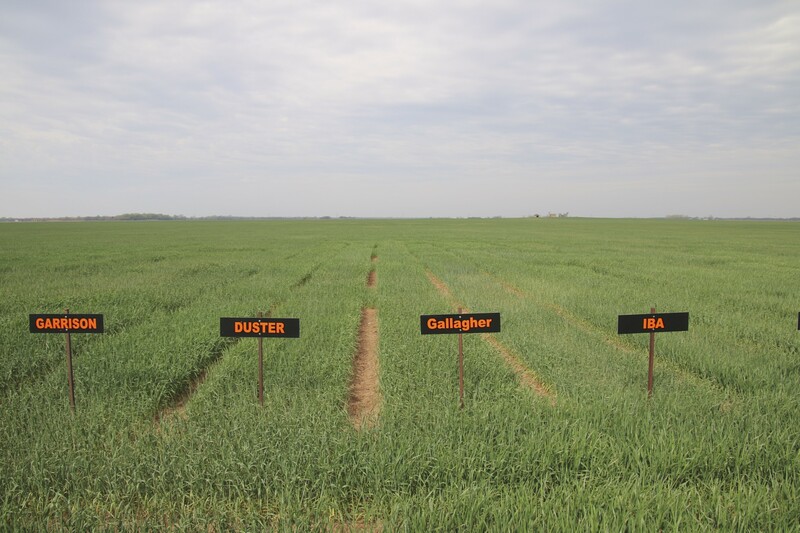 Their first stop was our wheat variety trials at Marshall Oklahoma where they found 20% injury in our grazed wheat plots and 51% injury in our non-grazed wheat plots. While planting date and management system clearly affected the level of injury, variety did not seem to have much effect. Next stop was a grazed field north of Hennessy where they found little injury. 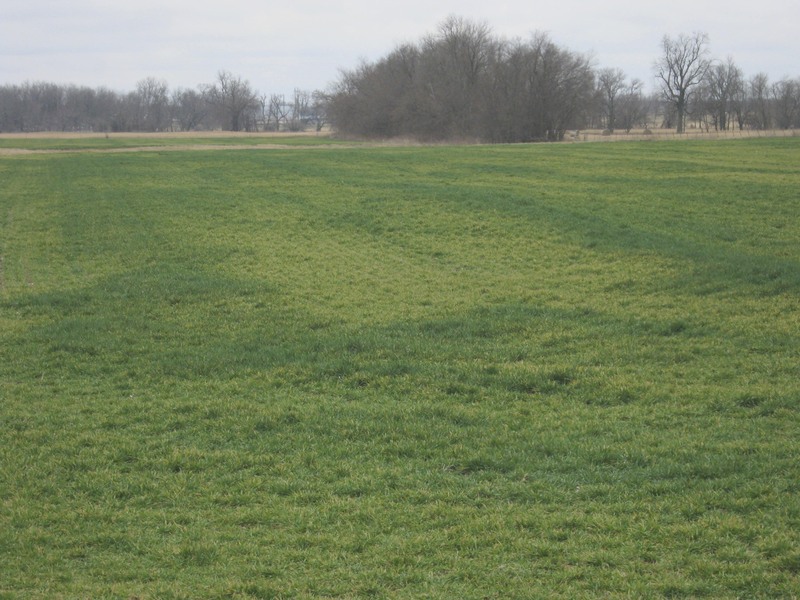 The same was true for a field in the Waukomis area and the Lahoma variety trial where they found less than 5% injury. Not too far to the north, however, our Lamont variety trial sustained over 80% injury. 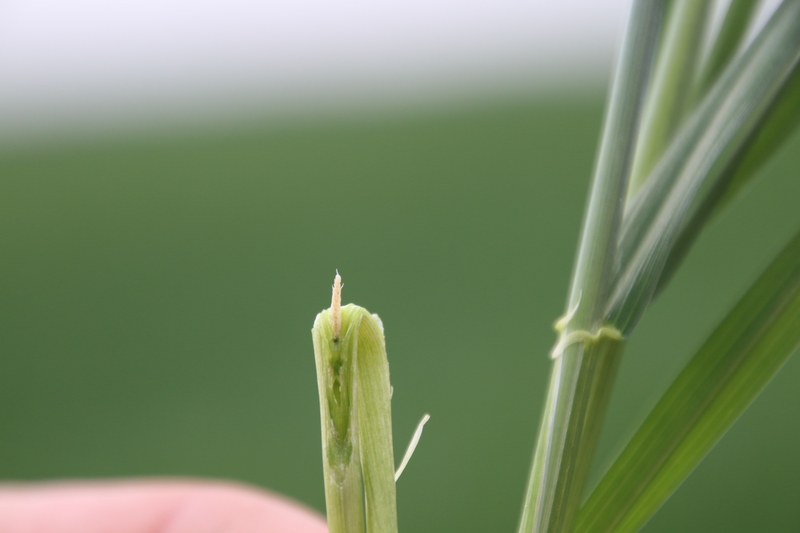 I received similar reports of severe wheat freeze injury from Curtis Vap in the Blackwell area. Late last week our team traveled to Apache to apply fungicides to the wheat variety trial, but never unloaded the sprayer. Freeze injury was severe and clearly visible without splitting stems. Our wheat at the Chickasha research station had little to no damage, and most wheat in the area seemed to dodge the freeze bullet. I will make a bigger loop into southwest Oklahoma later this week and report findings. 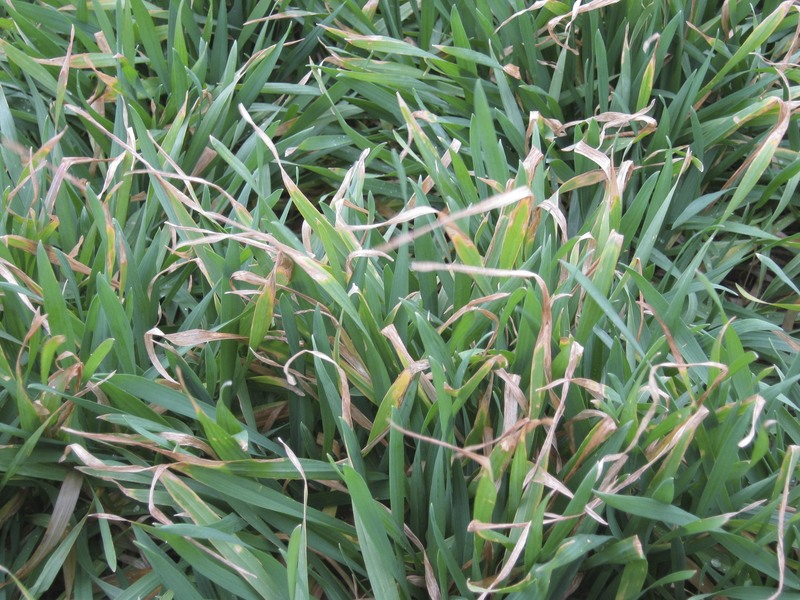 Injury symptoms should now be easily identifiable and growers can assess damage to individual fields. I recommend splitting 10 stems at four or five locations throughout the field and determining % injury from these numbers. If injury is extremely variable, increase sample size. While it is fairly easy to determine the extent of injury on individual fields, the hit or miss nature of freeze injury this year makes it difficult to estimate the total impact on the Oklahoma wheat crop as a whole. The drought has severely limited resilience in our crop and we are entering late April, so I do not anticipate there will be much of a recovery or rebound in fields that were severely damaged. It is important to note that 50% injury does not necessarily mean 50% yield loss. In most cases the actual yield loss will be less than the % injury. So, it is reasonable to expect that 50% injury might only result in a 35 or 40% yield loss. Of course, this depends on several factors such as soil moisture and temperature. Finally, a word on foliar disease and fungicide application. I would make decisions regarding fungicide application based on variety, current disease reports, and the yield potential of the crop as it stands right now. Our long-term data shows that fungicides protect yield potential to the tune of about 10%. Of course individual variety responses can deviate from this number but 10% is a good rule of thumb. I do not, however, recommend applying a fungicide to “assist the crop in recovery from freeze”. Again, make these decisions based on the remaining yield potential rather than an effort to attempt to nurse the crop back to health after freeze. 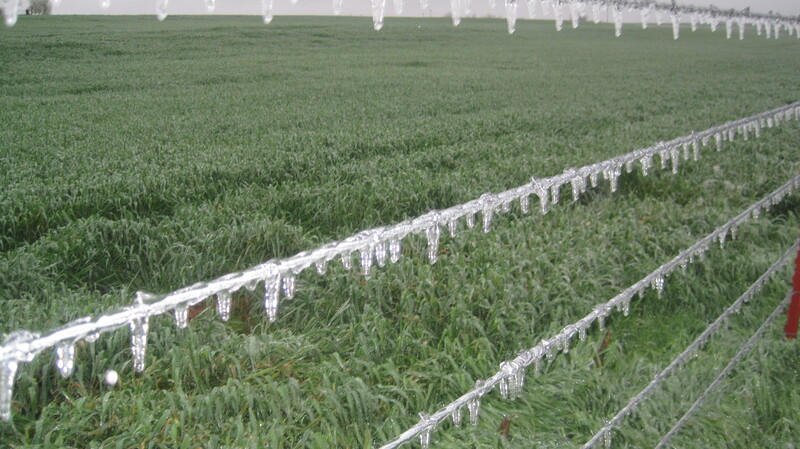 As evidenced by this picture from Marshall, Oklahoma, freeze injured wheat can still have a green appearance. 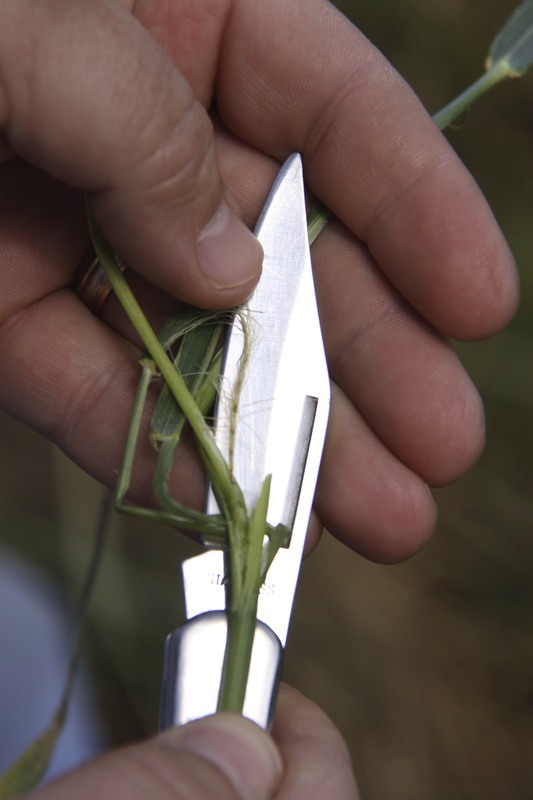 You must split stems to accurately assess injury. 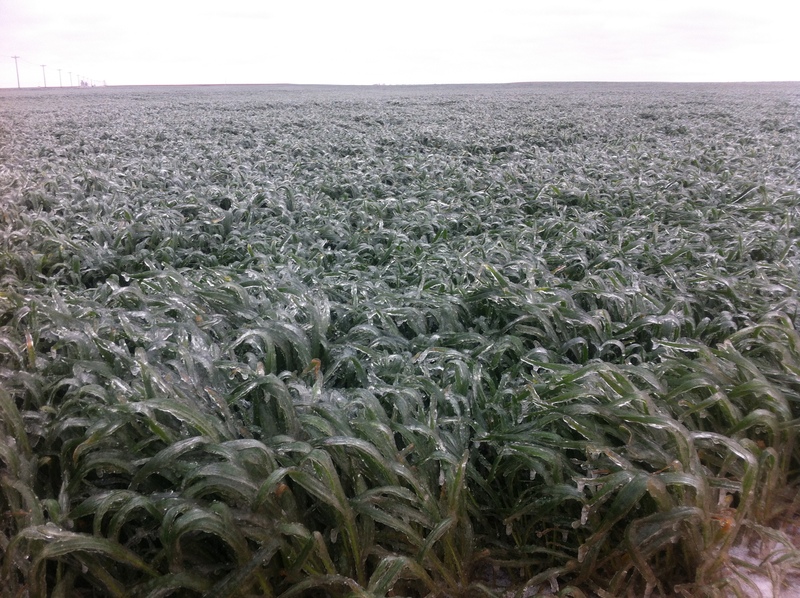 Freeze injured wheat at Lamont, Oklahoma. Freeze might have finished this plot, but drought had it with a standing eight count prior to the freeze. Freeze injury in Kay County Oklahoma. Photo courtesy Curtis Vap. I have posted a few images from the Oklahoma Mesonet below. 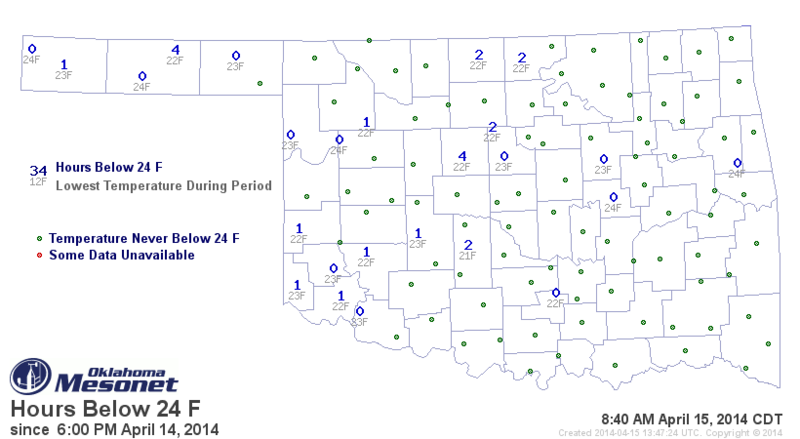 Most of Oklahoma spent at least four hours below freezing last night and some areas spent an extended period of time below 28F. 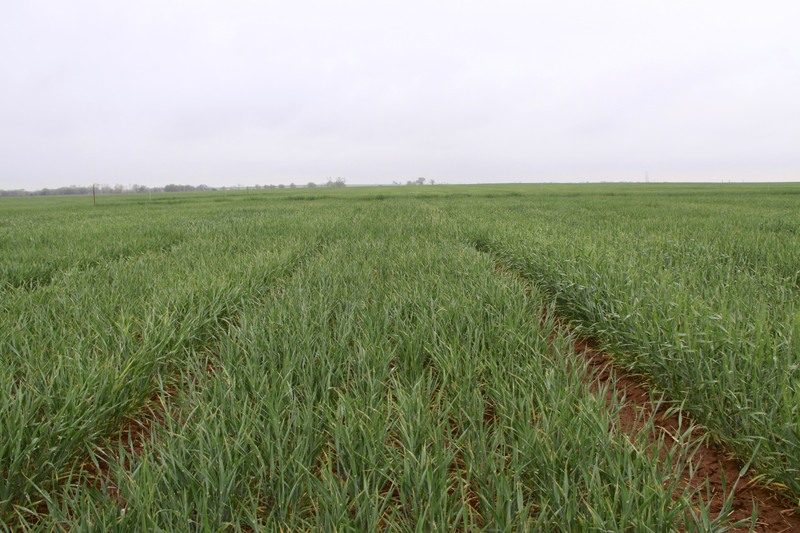 While temperatures in the wheat canopy might have remained slightly higher than reported air temperatures, they were still probably low enough to result in significant injury to wheat. 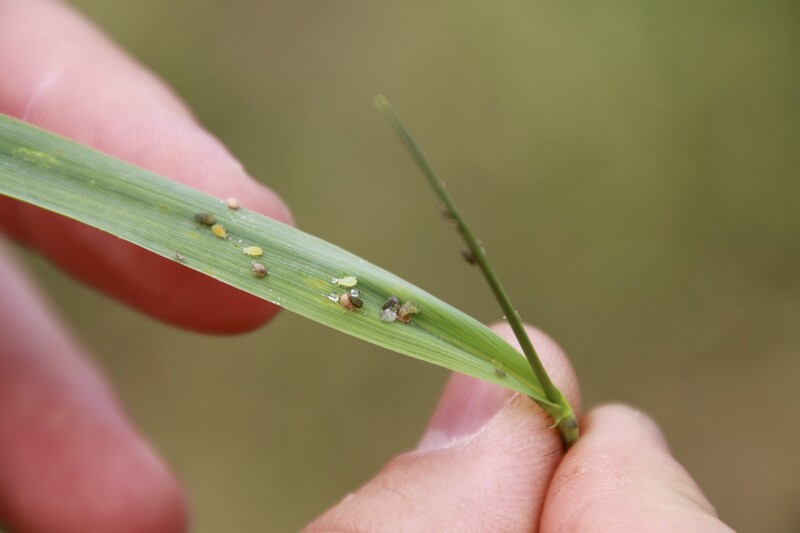 Over the next few days growers will need to inspect fields closely to determine the extent of injury. Symptoms may start to appear later this week and will likely be clearly identifiable by early next week. 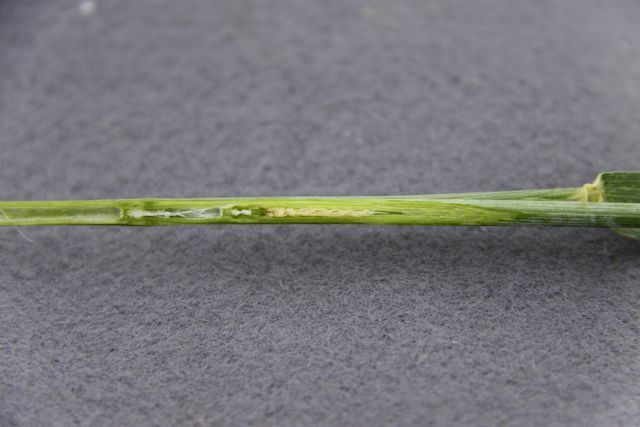 Healthy wheat heads will remain turgid with a green color. Damaged wheat heads will be bleached, yellow, or brown and will easily break when pushed against. I anticipate that we will not have any partial “blanking” of wheat heads and that most wheat heads will either be okay or a complete loss. What about new tillers? 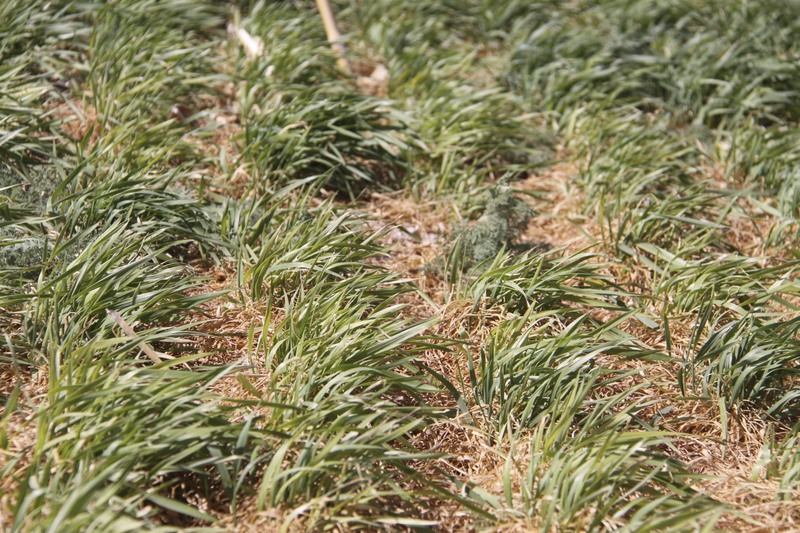 New tillers might emerge, but it is already April 15. In addition we have very dry soil conditions. For these reasons I am doubtful that newly emerging tillers will have much yield potential in areas south of I-40. IF (and that is a big if) weather conditions remain favorable, late emerging tillers in northern Oklahoma might still have a shot at producing grain. Freeze injured plants from Cotton County, OK. Note the green, healthy leaf coming through the desiccated leaves in the plant on the right. 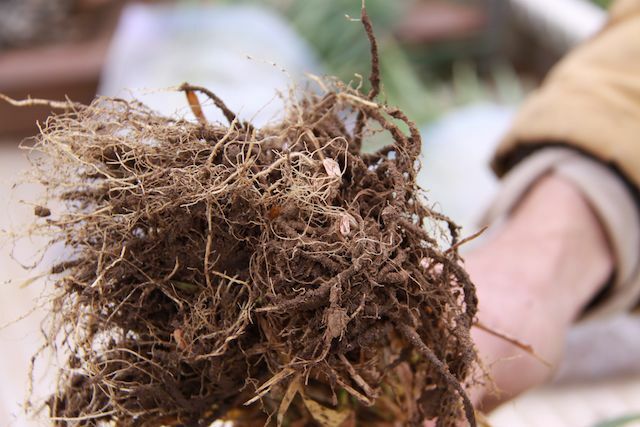 These plants will make a full recovery with adequate moist and fertility. 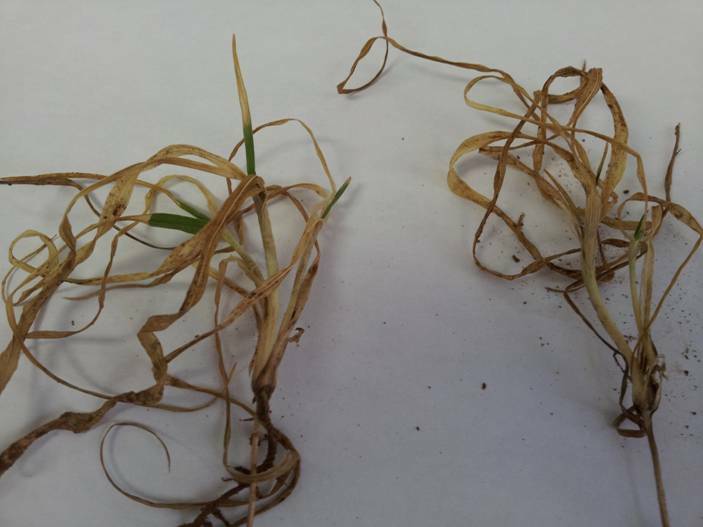 Our recent extreme shifts in temperature have resulted in moderate to severe freeze injury in some Oklahoma wheat fields. To be honest, the damage is not as widespread or severe as I thought it would be given that most of our wheat had not had an opportunity to harden off. The dry soil conditions in western and southern Oklahoma did not help the situation, as there was not sufficient soil moisture to buffer the temperature shift in the top few inches of soil. 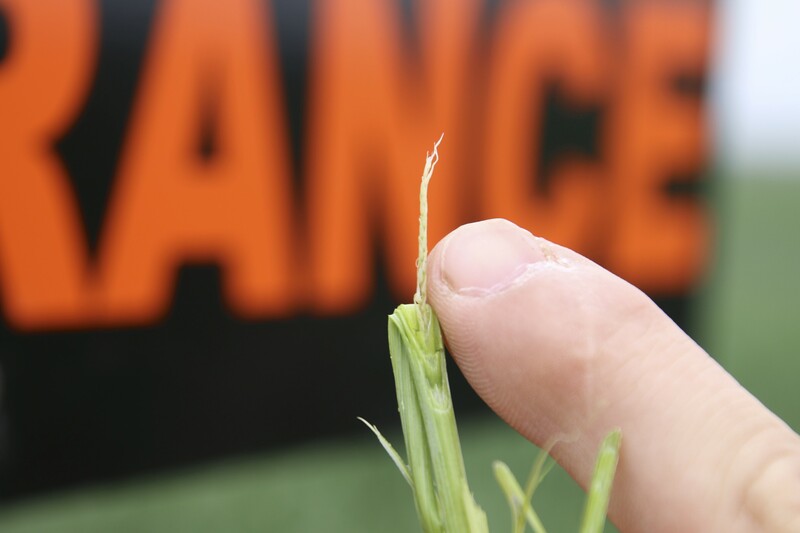 Freeze injury at this stage of growth (tillering) rarely impacts grain yield, but, as always, there are a few exceptions. 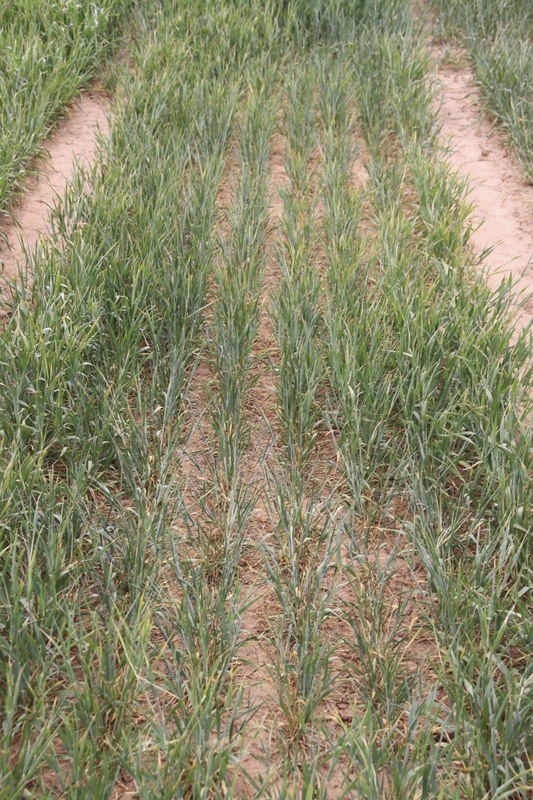 Wheat that was very small or late-sown is more susceptible to winter kill. Similarly, wheat that does not have a good root system or that was shallow sown due to crop residue is more susceptible to winter kill. It is best to wait until after a few days of favorable growing conditions to check for freeze injury. 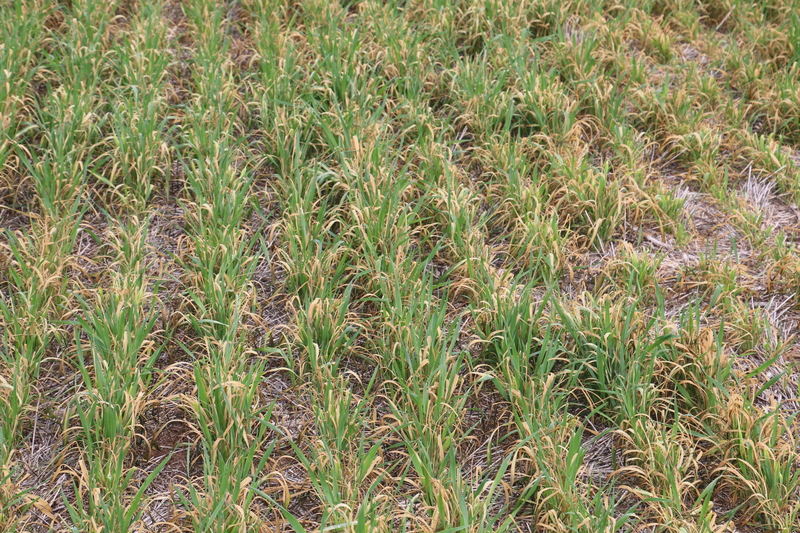 Plants with regrowth that is green and healthy should make a full recovery, and this will be the case for most Oklahoma wheat fields. 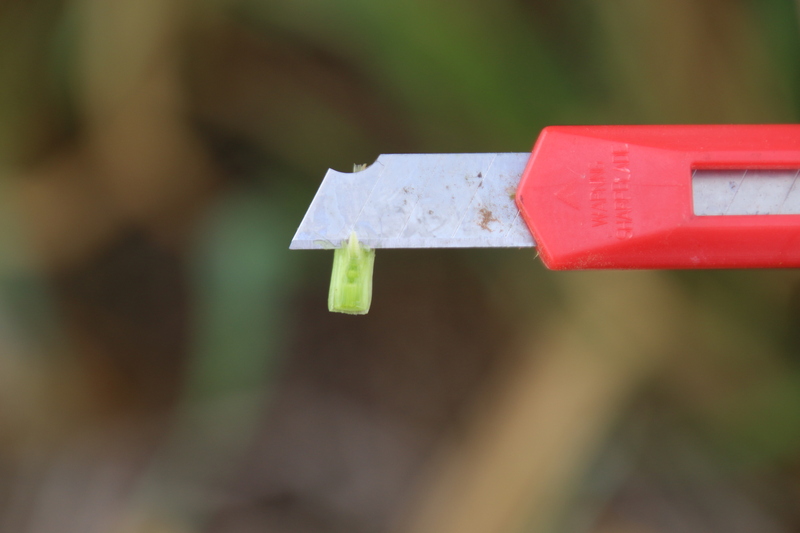 Freeze injury in late-sown wheat near Enid, OK. 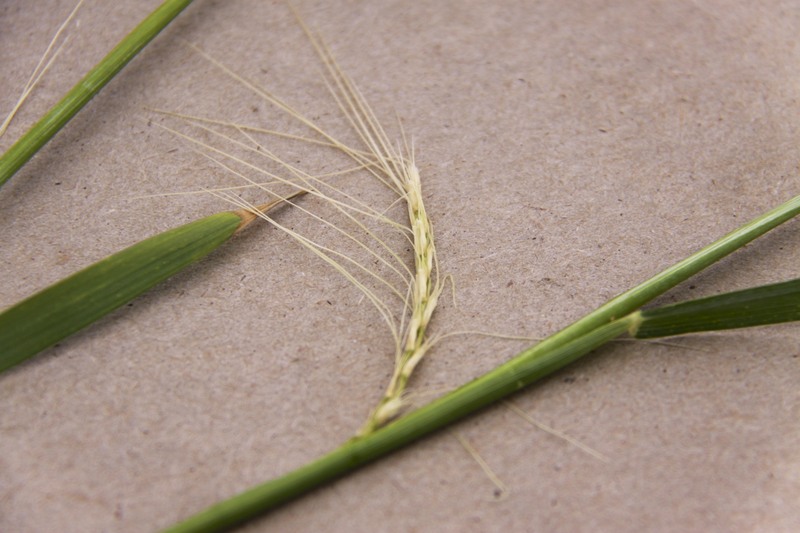 Some of the smaller plants might have a tough time recovering, but it is still too early to determine whether or not the field as a whole will adequate to produce a decent grain crop. Large amounts of freezing rain, sleet, hail, etc. hit the Oklahoma wheat belt on April 10, 2013 and temperatures are expected to drop to the mid to upper 20’s this evening (I posted a couple of pictures below). Wheat development ranges from early heading in southern Oklahoma to just past jointing in northern Oklahoma and the Oklahoma Panhandle. If forecasts are correct, wheat tillers in southwest Oklahoma that escaped the first freeze have a good chance of being taken out by this freeze. 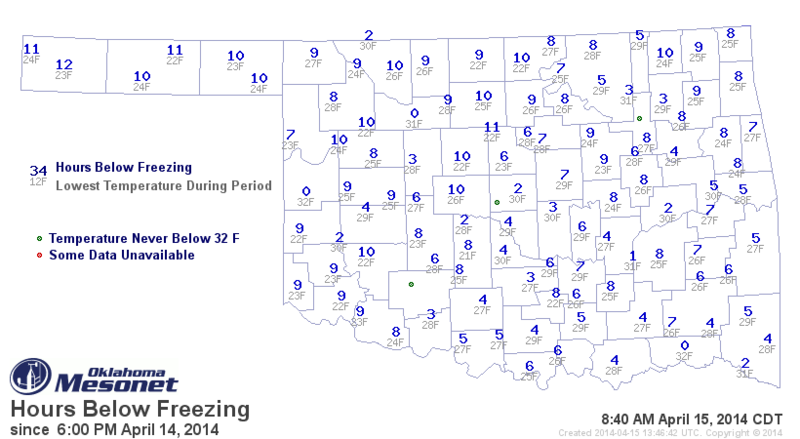 Central and northcentral Oklahoma has quite a bit of ice-covered wheat. Ice-covered wheat will remain at approximately 32F and this might be just warm enough to escape severe injury. If the ice melts, however, and temps drop into the 20’s even wheat that is just past the jointing stage can be injured. 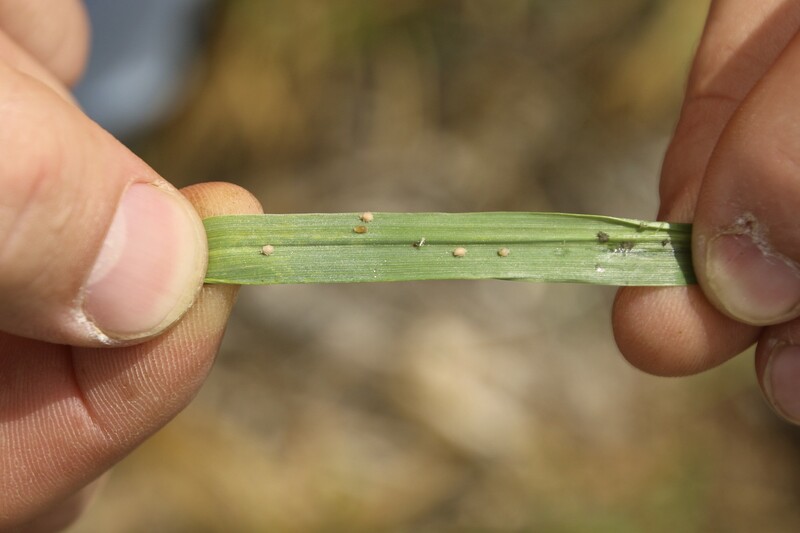 At this stage it is certain that we will have some freeze injury to the majority of the Oklahoma wheat crop, but it will be a good 7 – 10 days before we can accurately assess the level of injury. I have been asked if there is a 1:1 relationship between % freeze injury and % grain yield loss. Generally, the answer is no. DISCLAIMER — the values I am about to discuss are approximations and have huge margins of error — An otherwise healthy wheat crop that sustains 10% freeze injury prior to boot would probably suffer yield losses in the order of 0 to 5%. 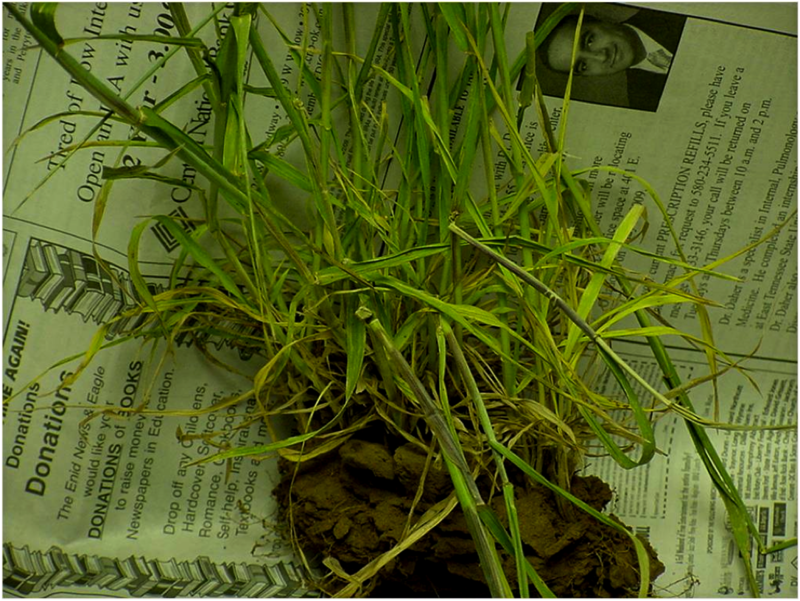 This is because the plant will divert resources to the remaining wheat heads. If damage is sufficient to reduce the final head count below a critical mass (around 400 heads per square yard) the relationship between % freeze injury and % yield loss will be much closer. 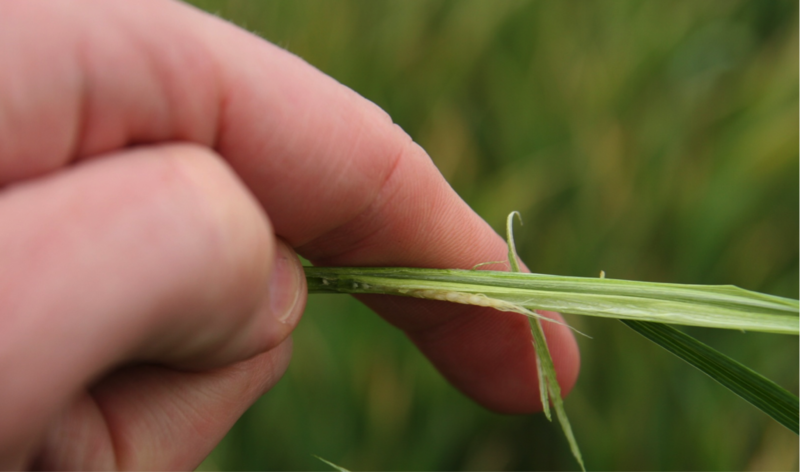 So a 60% freeze injury might result in a 40 – 50% loss in grain yield. Again, these numbers are rough estimations and environmental conditions following the freeze will greatly impact the plant’s ability to compensate after freeze.